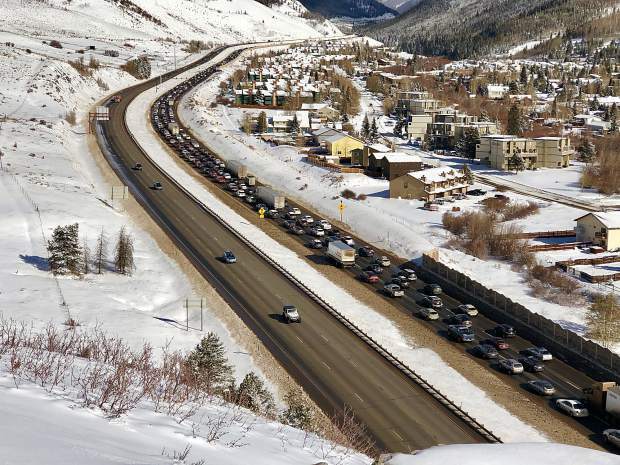 Eastbound traffic on Interstate 70 is slow-going Sunday after weekend snowstorm caused a 20-car pileup that shutdown the interstate for six hours on Saturday, leading officials to open Summit Middle School in Frisco as an emergency shelter for stranded motorists. 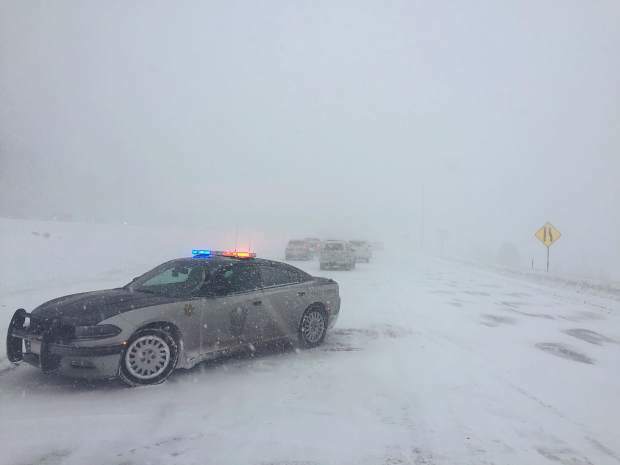 As a safety precaution, Colorado State Patrol closed Interstate 70 westbound on Saturday near Empire after a 20-car pileup shut down the eastbound lanes. 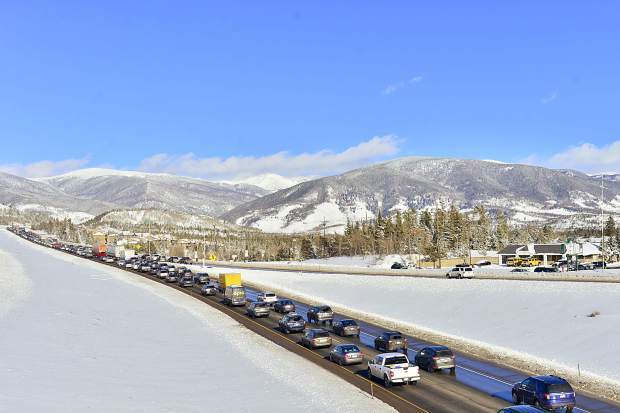 Eastbound traffic on Interstate 70 is slow-going Sunday after a weekend snowstorm caused a 20-car pileup on I-70 outside of Frisco on Saturday that lead the Colorado Department of Transportation to close the route for six hours. 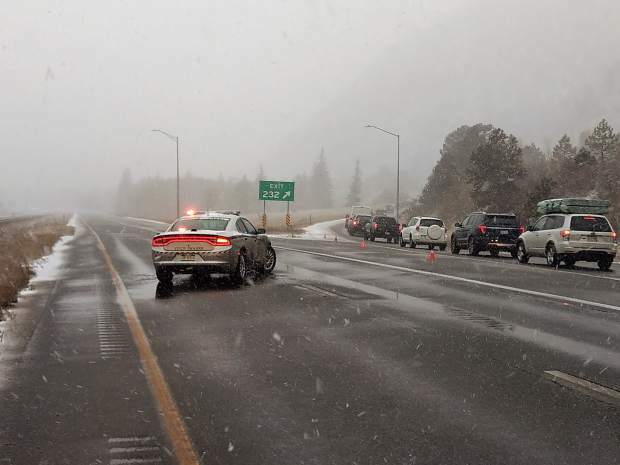 Colorado State Patrol closed Interstate 70 between Frisco and Silverthorne after a 20-car pile up stopped traffic in the eastbound lanes. Other interstate closures were reported throughout Saturday as a winter storm enveloped the I-70 corridor. This photo Tweeted out by Colorado State Patrol Master Sgt. Dan Enloe shows conditions at the Eisenhower Tunnel in Summit County. Many cars got stuck trying to climb the mountain to the tunnel and Enloe noted that many of the cars did not have adequate tires for the conditions. The coming days should be dry before another wave from the next storm cycle arrives in the Colorado’s central and northern mountains sometime between Tuesday afternoon and Thursday, according to the extended forecast from OpenSnow.com. What’s more important is that multiple storms will follow the first system, he continued, and there will be a chance for snow every day through about Dec. 7. Summit Middle School was empty and quiet Sunday. That’s not uncommon for a weekend, but it was a very different sight than the night before, when numerous motorists waited out a storm system that produced heavy snowfall across the mountains and snarled holiday travel. 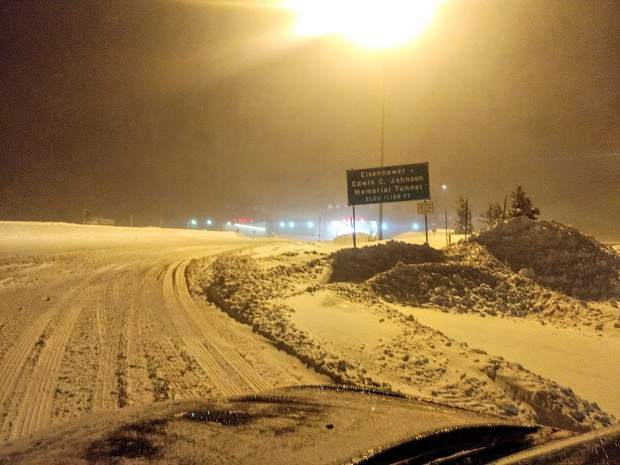 Across Summit County, accumulations were reported anywhere from 8 to 12 inches. The snowfall began Friday and the wintry mix continued throughout Saturday into early Sunday morning. As the holiday traffic on Interstate 70 came to a standstill on Saturday in Summit County, officials turned the school into a makeshift shelter. Well over 100 stranded travelers sought refuge at the school, said Summit County Sheriff Jaime FitzSimons, adding that about 80 ended up staying the night there. The primary cause was a 20-car pileup on Interstate 70 East between Frisco and Silverthorne. No major injuries were reported in the crash involving so many slow-moving vehicles, said trooper Josh Lewis of the Colorado State Patrol, but it closed the interstate for about six hours. Story continues under video. Warning: Video contains language some may find offensive. When I-70 did finally reopen around 6:30 Saturday night, snow was still falling and many of the weary travelers simply opted to hold off for Sunday’s sunshine and calm winds before heading back out. In assisting state troopers with the interstate closure, the sheriff’s office had its deputies blocking on-ramps at exits 195, 201, 203 and 205. At the same time, spun out vehicles littered many Summit County roads. To help manage the closures, provide security at the middle school and respond to local accidents, the sheriff called in off-duty personnel. Thankfully, FitzSimons said, there were no reports of any incidents at the school and no major injuries associated with any of the off-interstate accidents, which he described as drivers mostly getting stuck in the snow. With so many vehicles getting stuck across the county, especially on I-70’s mountain passes, it wasn’t just the troopers and deputies because local towing companies had their work cutout for them Saturday, too. “It was busy all day, and I would say half the night,” said Brian Ellis at Ski Country Auto/Truck Repair and Towing in Frisco, one of a number of local tow truck companies enlisted by state troopers to help clear the mess. And they weren’t the only one. “Oh yeah, I probably had about 75 to 80 calls for tow trucks (on Saturday),” said Olivia Leary of Dillon Towing and Recovery, who agreed this weekend’s storm has been the most significant weather event of the 2018-19 ski season. A video from the top of Loveland Ski Area’s new high-speed lift, Chet’s Dream, shows a total whiteout with 50-60 mph winds with as much as 1 to 2 inches falling per hour during peak times. By Sunday morning, the snow had subsided into lingering flurries under sunny skies. 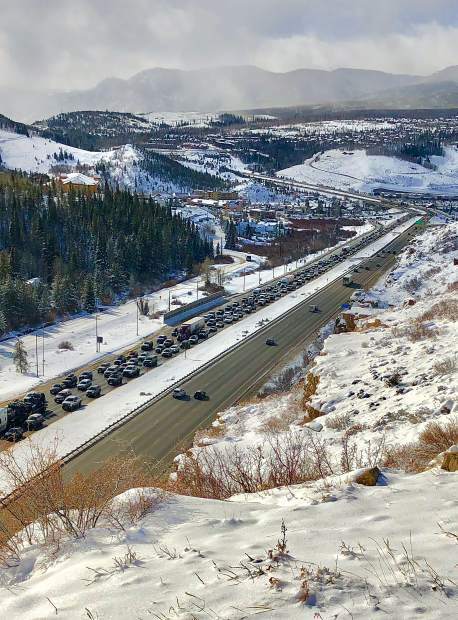 Lewis said there were no issues he was aware of on I-70, and a long line of cars hit the interstate again — many coming up from Denver and headed for the county’s ski resorts, which always like to brag about how much snow they get after such an event. Of the five nearby ski areas, Arapahoe Basin was the big winner with a foot of new snow on Saturday and 22 inches over the last three days. Nobody got left out, though, and Breckenridge (11 and 18 inches), Loveland (11 and 22 inches), Keystone (7 inches and 16 inches) and Copper Mountain (6 and 11 inches) all reported nice boosts to their snow base, according to OpenSnow.com, one of the more accurate places to go for mountain weather forecasts. While Gratz was encouraging skiers and snowboarders to take advantage of the weekend’s weather, the sheriff wanted to remind people that, as crews continue to plow county roads over the next 24 to 48 hours, it’s important people don’t park their vehicles on the roads. FitzSimons’s biggest concern is access for emergency vehicles, like fire trucks and ambulances. He said his deputies try to be “nice” about vehicles parked on the roads and find the owners, but if a parked car is preventing crews from plowing the road, the car could get towed.